IF THE timber roof bearers of the Old Fernvale Bakery cafe today could talk, what a story they would tell. One of the many ex-servicemen who battled the hardships of post-war Queensland and yet managed to build one of Fernvale's most respected and successful businesses in the town's main street. Harold Norman Prain, known as Curl Prain, was a young man of 27 when he was demobbed from the 2nd/34th Australian Corps Troops Supply Column, in 1946 after having serviced in two theatres of war - the Middle East and New Guinea. He returned to the Glamorganvale Hotel where his young bride Lorraine lived with her parents, Walter and Annie Spreadborough who were then the licensees of the hotel. "Curl immediately started to make plans for our future," the now 89-year-old Mrs Prain recalled of her late husband. 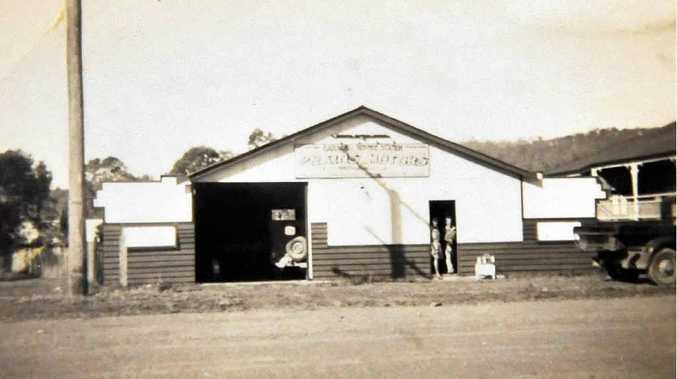 "He had noted that there was no mechanical workshop or service station between Ipswich and Esk and decided that Fernvale was an ideal spot for such a business." Curl sought property in Fernvale and paid 600 pounds in cash for a corner block of land which sat at the corner of the Brisbane Valley Hwy and Simpson Rd, as it is known now. It was owned by the Ehrich family late of Fairney View. "There were also two blocks of land in separate deeds at the back adjacent the local hall," Mrs Prain said. "The house wasn't in good state - most of the windows were broken. "To a young bride, it didn't look very appealing at all, but I loved and trusted Curl and I knew with his skills it could be improved." And so Curl got to work, hastily drawing up plans with his own hand to put forward to the Esk Shire Council for approval. "We had many a run in with the council over the plans and years later too when additions were made," Mrs Prain said. Mrs Prain said in those post war times building materials were scarce, so her husband attended every farm sale he could to obtain timber and roofing iron. He also made special trips to the Army Navy Airforce Surplus sales in Brisbane and auctions to develop his tool kit, and at times had to fashion his own tools. 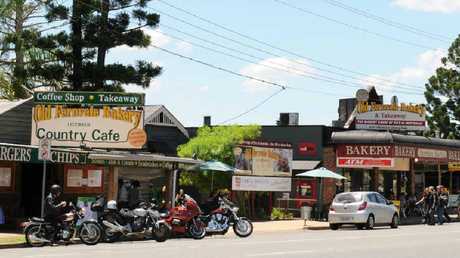 The Old Fernvale Bakery Country Cafe in the main street of town. "Timber wasn't easy to come by and the saw mill struggled to try and keep up with the demand after the war," she said. Andrew Denning, who owned the local sawmill, cut high beams for the roof of the garage, which is the only remaining trace of the garage still visible inside what is now known as the Old Fernvale Bakery Cafe. After facing a small set back of being hospitalised after crashing his motorbike and injuring his knee, Curl was then able to begin building the garage with the help of his father-in-law, Walter, brother-in-law, Sid and his own brother, Ron. "They often laughed in later years remembering that the garage was built by an ex-soldier with a crippled and very painful knee, my father, and two unreliable 14-year-old boys," she said. "They complained regularly of how tired they were and how they couldn't carry on but then, the next minute, we would see them both walking down towards the river with a heavy corrugated iron canoe on their heads." It was a proud day for Curl, some months later, when his family stood back and admired the finished product - Prain's Motors. Fuel pumps were subsequently installed and Curl became the petrol agent for Atlantic Oils. Mrs Prain said many local farmers and graziers populated the Fernvale region, and a huge bulk of her husband's work was attending breakdowns of their milking machines and irrigation systems on the various river banks - the Twin Bridges, the Wivenhoe and the Northbrook River, both now lost to the Wivenhoe Dam. 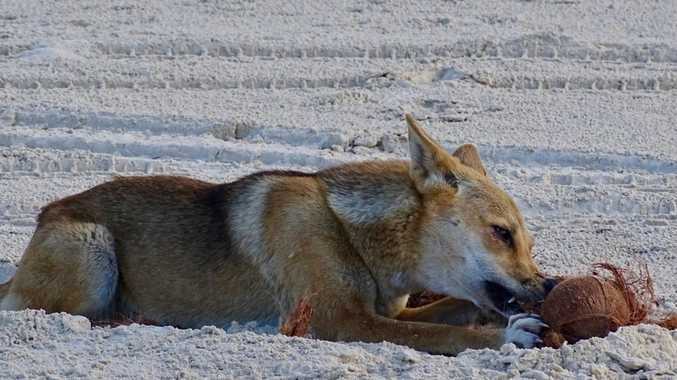 "He was a very skilled mechanic and was honest and reliable and soon built up a solid good clientele among the famers and property owners in the wider community area," Mrs Prain said. With his one-man business well and truly off the ground, Curl delved into the world of dealing in new and used cars. Some time after August 1952, Curl built a small cafe next to the house. "I ran that myself and used to enjoy our day in Brisbane every Monday when we would go to the wholesaler to buy supplies," Mrs Prain said. Together the couple raised six children in Fernvale - Lorraine, David, Mark, Debbie, Leah and Paul. "I'm sure our children have fond memories of their young life in Fernvale - free and easy," she said. "What we lacked in money was made up for in love." 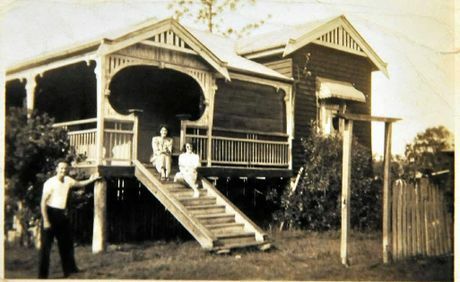 Harold ‘Curl’ Prain stands in front of his Fernvale home, which was built next to the garage, with wife Lorraine and sister-in-law Athole.